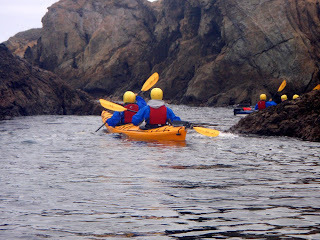 On Saturday we had a great coastal exploration of the rugged Fort Bragg Coastline. Rain was in the forecast for the Mendocino Coast and the skies were a bit gray, but the tide was high and the ocean was calm and beautiful. We had the pleasure of sharing the calm before the storm with a family from Santa Rosa. 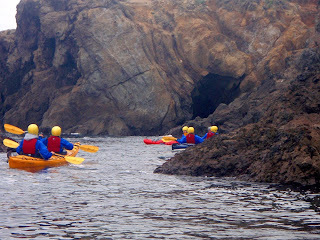 We got to explore some of the "inside" passages along the Fort Bragg Coastline that are only accessible to kayaks and only on certain tides. Two of the photos here are of one of my favorite spots which we call the "maze." I paddle this area a lot and each time continue to be awed by these awesome geological features. As we watch a blowhole, I marvel at the handiwork of the ocean in carving this beautiful coast. We are thrilled to see the return of the Pigeon Guillemots to the Mendocino Coast. At first we hear their high pitched wheezy whistle and then start seeing them in the water and flying to their nests. We are careful to give their nesting areas a wide berth. They too are fans of the rugged Mendocino Coast as they like to nest in the sea caves, arches, and nooks that the ocean has carved into the rocks. After a meander through our coastal rocks and checking out some oyster catchers, we ventured out to sea to look for whales. We love our tandem sea kayaks because they are so stable and fast that we can easily guide novices out into the ocean. 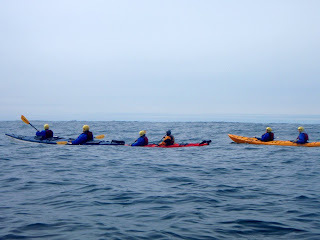 The sun poked out, and we were all quite warm as we paddled about a mile off shore to look for whales. The whales were not particularly cooperative with our mission to see them. Sighting three spouts were the extent of our whale watching; however, we got to see some murres and had a great viewing of the colony of California Sea Lions that hangs out near and on the Noyo's bell and whistle buoys. Our return to the Noyo Beach was easy as the wind and swells carried us along. 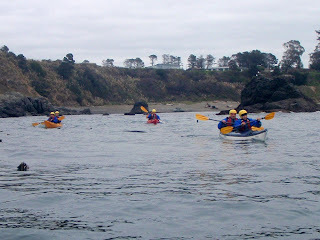 With our coaching, our novice kayakers were able to surf a couple of the swells which is an exhilarating feeling. As we returned to Noyo Beach, we were greeted by some friendly dogs who were enjoying another beautiful day on the Mendocino Coast.